Over the years W & J Riding had a number of contracts which required their vehicles to be painted up in the customers own livery. One such contract was with Solrec of Middleton Road Heysham and as the name implies the company were in the solvent recovery business. Seddon Atkinson 400 Series 4x2 tractor unit Reg No GAT 246T named 'Mons Meg' was powered by a Cummins 290 engine and driven on a regular basis by Dave Eastwood. Registered new on the 1st of July 1979 GAT 246T was originally operated by TDG group company Gilyot & Scott Ltd of Hull. Purchased secondhand in November 1981 from Yardley Commercial Vehicles of Kidderminster at a cost of £9,250 plus vat a further £2,189.93p was spent installing pumping equipment to the vehicle before it entered service. The purpose built trailer above was used to collect dirty product in drums from the users and after cleaning it was sent out again to customers in the stainless steel tank located in the middle of the trailer. 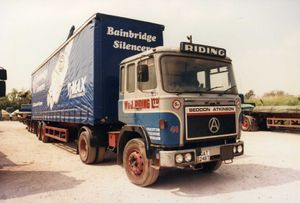 After a total of nine years service with Riding's GAT 246T was finally sold on to a Mr J. Williams of Blackrod on the 13th of June 1988 for the sum of £3,000 plus vat. 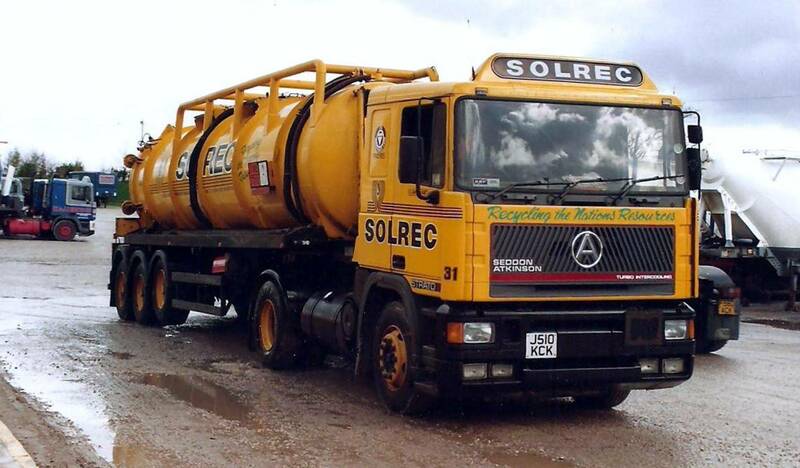 Seddon Atkinson 400 Series 4x2 tractor unit Reg No TUN 111T Fleet No 19 'Flying Dutchman', driven by Ted Dixon, is seen here coupled to a vacuum tanker that was used to collect dirty solvent in bulk at customers premises who had this facility. 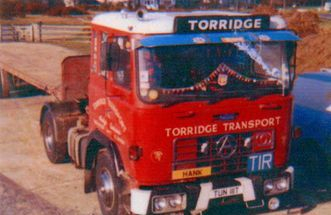 This particular tractor unit was purchased second-hand by Riding's having been originally registered new, on the 7th of September 1978, to Torridge Transport of Devon. 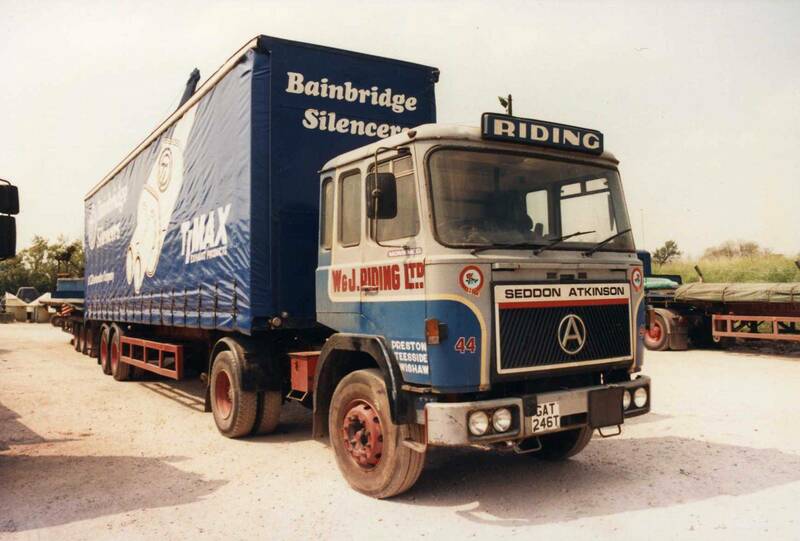 Fitted with a 240 Gardner 8 cylinder engine Reg No TUN 111T duly had a third life after being with Riding's, when John Killingbeck of Blackburn bought it and turned into a very successful double drive 3 axled tractor unit. 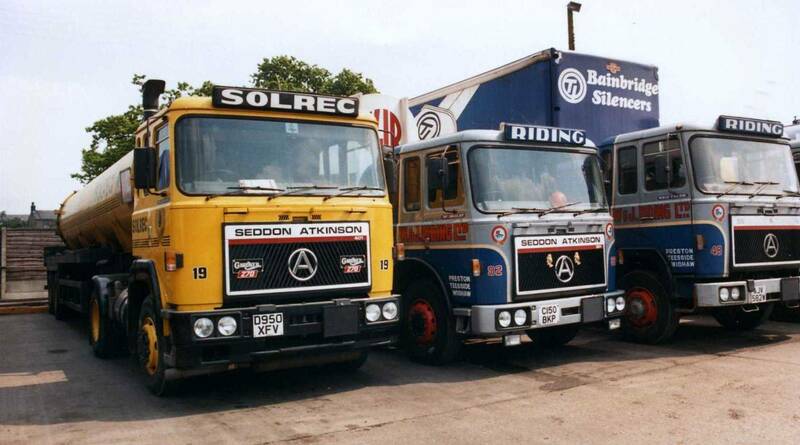 In the foreground, of this nice line up of Seddon Atkinson tractor units, is Seddon Atkinson 400 Series 4x2 tractor unit Reg No TUN 111T Fleet No 19 'Flying Dutchman'. Driven by Ted Dixon, and powered by a Gardner 240 eight cylinder engine TUN 111T was purchased second-hand by W & J Riding. Seddon Atkinson 401 Series 4x2 tractor unit Reg No C490 JHG Fleet No 10 'Relentless' was registered new by Riding's on the 1st of December 1985 at a cost of £26,528.62p. 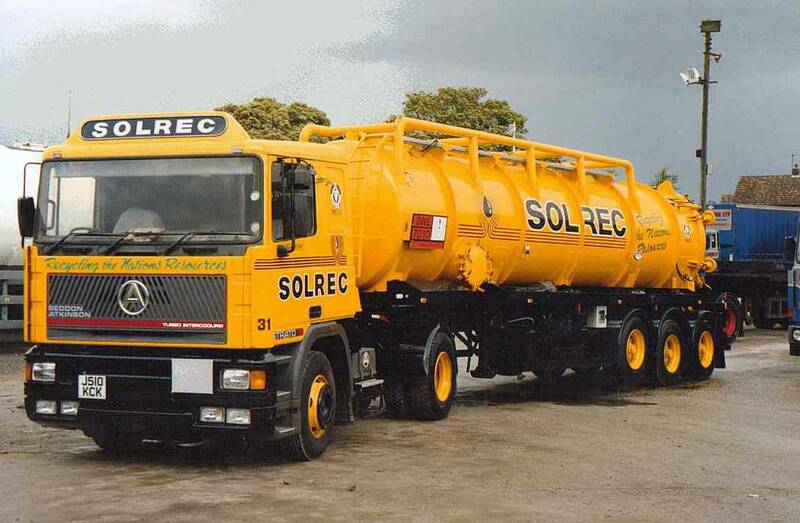 Allocated brand new to the Solrec contract a further £3,128.49p was spent on fitting pumping equipment which was necessary to do the job. Driven from new by Dave Eastwood it was powered by a Gardner 6LYT 320 engine and replaced Seddon Atkinson 400 Series Reg No GAT 246T. 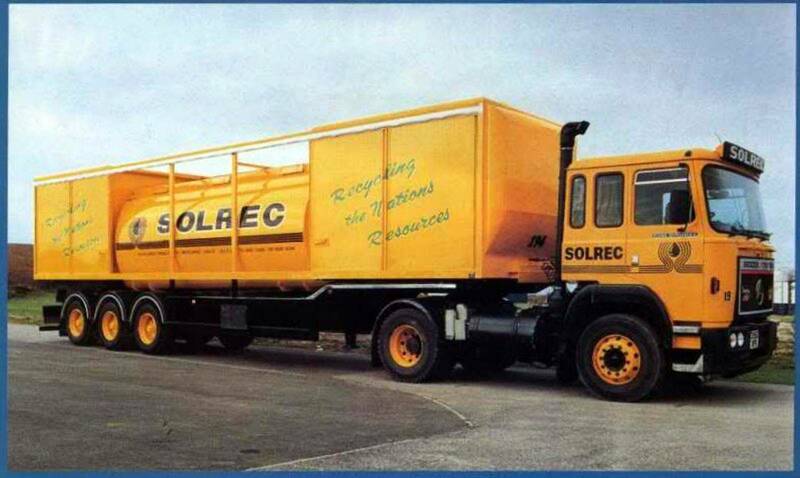 In September 1991 when six years old it was taken off the Solrec contract and repainted into Riding's familiar blue and silver livery and put to work on the general haulage fleet. 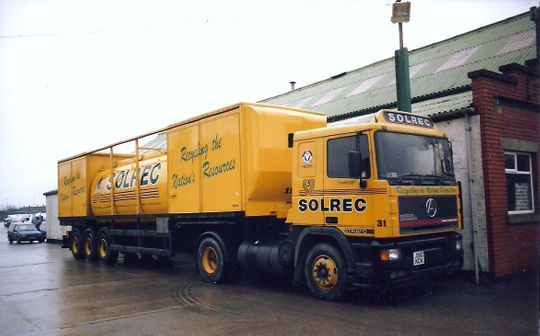 After three years on the general haulage fleet it was sold onto J C Commercials of Bootle when nine years old on the 25th of July 1994 for £2,500 plus vat. This particular photograph of Seddon Atkinson 401 Series 4x2 tractor unit Reg No C490 JHG Fleet No 10 'Relentless' appeared in a 1991 edition of Commercial Motor. At the time the tri-axle Solrec trailer was brand new replacing the one of the previous design that had been used for a number of years. Built by Lancashire Trailers of Bamber Bridge Nr Preston the trailer had a 23,000 litre triple sectioned stainless steel tank mounted centrally between twin-decked compartments. The 3.0m-long end structures housed 40 drums each had hardwood aluminium-lined none-slip flooring with safety frames and internal straps while the aluminum doors slide alongside the tank on full length rails to allow loading from either side. Storage compartments were also built into the structure with trays which were designed to hold the discharge hoses. Seddon Atkinson 401 Series 4x2 tractor unit Reg No D950 XFV Fleet No 19 'Flying Dutchman II' was registered new by Riding's on the 6th of March 1987. 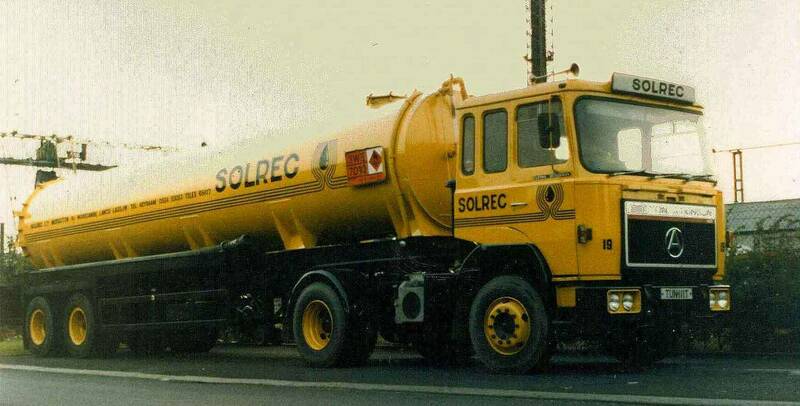 Driven from new by Ted Dixon it was powered by a Gardner 270 engine and was one of several in the Riding fleet that were assigned to the Solrec contract and painted in the company's striking yellow livery. Registered new on the 10th of September 1991 Seddon Atkinson Strato 4x2 tractor unit Reg No J510 KCK Fleet No 31 'Flamboyant' was powered by a 365 Cummins engine. It is coupled to a brand new tri-axle suction tanker built by Vallely Tanker Engineering Ltd of Barnsley and was used, like most of the other tankers in Solrec livery, for collecting dirty solvent for recycling or burning. Seddon Atkinson Strato 4x2 tractor unit Reg No J510 KCK Fleet No 31 'Flamboyant' shows it coupled up to a newer version of a Solrec trailer than the one of the previous design pictured at the top of this page. 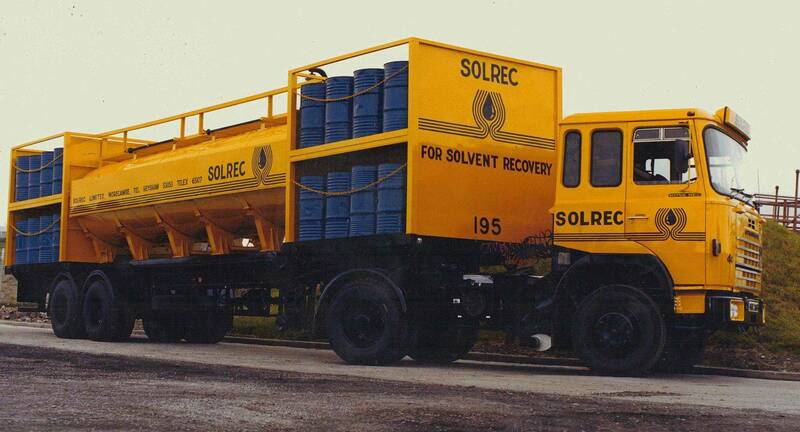 This trailer had sliding doors to prevent any possible spillage from any leaking drums of dirty solvent which in some cases could be quite harmful. Seddon Atkinson Strato 4x2 tractor unit Reg No J510 KCK Fleet No 31 'Flamboyant', powered by a 365 Cummins engine, was registered new on the 10th of September 1991. It is pictured here parked in the depot at Longridge on the 29th of August 1993. 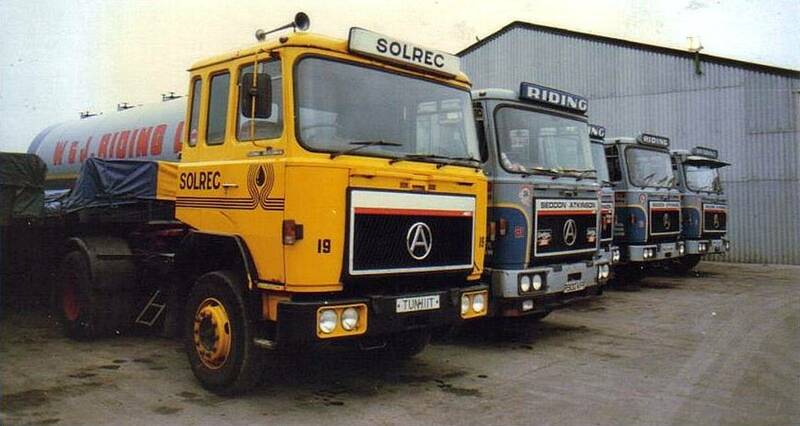 The final shot of Seddon Atkinson Strato 4x2 tractor unit Reg No J510 KCK Fleet No 31 'Flamboyant'. 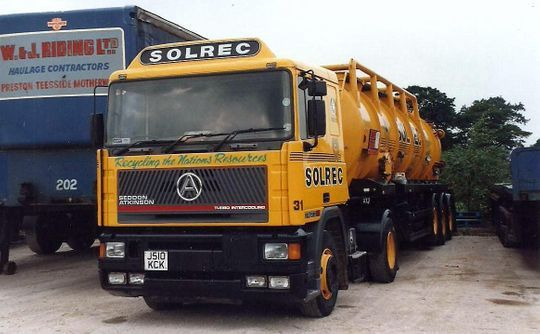 Registered new on the 10th of September 1991 it is seen here on the 9th of April 1994 hauling an empty tanker while heading for the workshop in Longridge depot.